Chatwing, a new and competitive chat widget, can now function freely in any blog. Once Chatwing is embedded, visitors can begin chatting right away. This is a social opportunity that can grant benefits to everyone. Blogs are no longer the things of the past—they are the mirrors of communication and current events. Through blogs, people can read entertaining content, advertising, and literary pieces. A business is even weak if it doesn’t have a blog. What if there is a way to make blogs more interesting? That is the sole premise of a free chat box known as Chatwing. Chatwing is a basic tool that can be used by everyone as long as they are connected to the Internet. It is a widget that utilizes the freemium business model and brings a new face to the online chat experience. Though powerful in its own home page already, Chatwing’s potential is redoubled once it is installed to a blog. According to some avid bloggers who used the Chatwing shoutbox, their blogs gathered more than enough visitors within a week. These visitors would often chat in their blogs, discussing things such as current events, contents of the blog, and business opportunities. In a way, Chatwing becomes the customer service section of any blog. Chatwing users also mentioned that they were enticed by its easy installation features. After registration, new users can now proceed to customization of their widgets. Customization of the widget takes only a few minutes. Embedding follows afterwards. The shout box will be operational in just few seconds prior to embedding. Chatwing targets a large base of audience but it singled out bloggers because they take up a considerable portion in the World Wide Web. Chatwing also appealed to a lot of students because of the fact that they want to enjoy a traditional weekend chat. Online business owners were also considered since a usual marketing campaign takes hundreds to thousands of dollars, yet there is only little guarantee of exposure. In its simple way, Chatwing is reprised as a small marketing tool for imminent success. Some corporate blogs are already using it, especially those ones involved in commodities and wholesaling. The corporate blog would relay product information through its contents. After reading the contents, visitors can now talk about them in the Chatwing shout box. The marketing process is quick, informational, and user-friendly. When it comes to location, the release of Chatwing is exponential. Anyone who is connected to the Internet can access Chatwing and utilize it well. This simply means that many people can now enjoy the Chatwing free chat opportunity. To know more important information, visit the Chatwing website. Chatwing.com has developed live chat software for websites and blogs. The Chatwing.com website offers users the ability to signup and create a customizable live chat feature in seconds. Users have the ability to customize the size, color, and fonts of the chat product. The ability to chat via social media accounts such as Facebook and Twitter enable Chatwing to offer a personal and unique real-time experience to all sites. 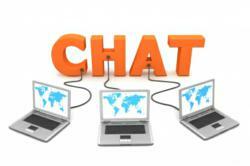 Chatwing is 100% free web chat software.